Dear Chris Hayes: Good Job. Now Let’s Get Real. 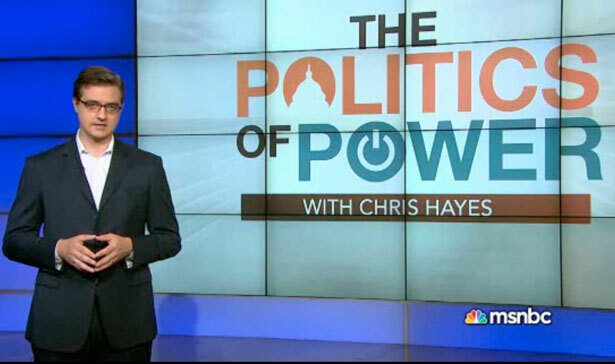 A reaction to Chris Hayes's MSNBC documentary on climate change, The Politics of Power. First off, since we’ve never met, I want to say how much I appreciate your work, and in particular what you’re doing with All In. You’re holding down some vital turf in the media landscape, and doing it with distinction—and I know how challenging that can be. And I especially want to offer big, sincere thanks for The Politics of Power—it’s no small thing to air an hour of prime-time television like what we saw on Friday night. Your commitment to elevating climate, and climate politics, as a regular part of the show’s coverage is hugely encouraging. And I’m glad, speaking as someone who’s deeply engaged in the climate fight, that you don’t shy from suggesting the severity and urgency of the climate crisis—or at least, that you begin to suggest it. Which is far more than can be said of most of our media. I felt there were three pretty important things missing from The Politics of Power. The first is what I’d call a full dose of climate reality. I would’ve liked to see you explain to viewers the real carbon math, and the true magnitude of the challenge we face—as spelled out so starkly and effectively by folks like Bill McKibben, Joe Romm, David Roberts, The Nation’s Mark Hertsgaard and others, not to mention the IEA, World Bank, even PwC and HSBC—and to explain what it means for the kind of planet our children, yours and mine, will inherit this century if we don’t radically change course. I’m referring to the fact that something to the tune of 80 percent of existing fossil fuel reserves need to stay in the ground, over the next four decades, if we’re going to have a shot at a livable climate. Not only that, but the IPCC reported in 2007 (in its most recent assessment report) that global emissions need to be cut some 25 to 40 percent below 1990 levels by 2020 in order to have a reasonable chance of making the required 80 percent reductions (or more) by 2050. The IPCC’s new assessment report, due out this year and next, may paint an even more urgent picture. So, given all that, the second thing I found missing was a full dose of political reality: the fact that even the most ambitious policies currently on the table in Washington—or even imaginable in Washington, such as an economy-wide price on carbon—don’t come close to addressing that fundamental carbon math. You rightly point to congressional obstruction, bought and paid for by the fossil-fuel lobby, forcing Obama to act unilaterally. But even if Obama’s climate plan is wildly successful (in Washington terms) and he manages to fulfill his Copenhagen pledge of 17 percent reductions (below 2005 levels) by 2020, do your viewers understand how far that is from what science tells us is necessary? And do they understand the full implications of this gap between the politically “possible” and the scientifically necessary? In other words, do they understand the kind of profound political change needed in order for us to begin addressing the climate crisis in a serious way? It’s not just about getting the climate-science denying obstructionists out of the way, it’s about forcing even our strongest climate champions, at all levels of government, to confront the actual scale and urgency of the crisis. I felt the program could have been stronger if it had acknowledged those two stark realities, the scientific and the political, head on. But the thing that really struck me more than anything was this third omission: there was no mention of the climate movement, despite the fact that you interviewed both Bill McKibben and May Boeve of 350.org. Bill may in fact be “our most important environmentalist,” but the reason he belonged there on your show is that he and his colleagues at 350 have done far more than create just another environmental organization, in any conventional sense—it’s that they, together with many partners and allies, have spearheaded a global, grassroots, people-powered climate-justice movement that is as much about human rights as “environmentalism.” And this movement, while still relatively new and small, is gaining unmistakable momentum as it takes on the entrenched power of the fossil fuel interests. Just look at what they’ve accomplished in the Keystone fight. That’s the real story. The movement. [UPDATE: McKibben has just posted a new essay on this very subject, which I managed to miss, and it's pretty essential reading.] Of course, there’s plenty of room for debate about what kind of movement it should be, and how to build it. But I was deeply puzzled by the lack of any acknowledgment that this movement even exists. In the end, you exhorted viewers to vote politicians out of office if they won’t take action—which is commendable! And yet, conventional electoral politics only scratches the surface of the sort of political engagement we need if we’re going to build a movement that can retake our democracy and fundamentally transform our politics to address this crisis in a meaningful way. Is it hard to imagine that sort of deep transformation? Yes, it’s very hard. Damn near impossible. But it’s our only hope. I don’t want to presume anything about what’s going through your mind, but I worry that you may be trying not to sound “politically naïve,” or “unreasonable,” or “unserious”—or for that matter, that you’re trying not to bum people out too much by letting on that the current situation is hopeless. But, Chris, under any currently imaginable political scenario—that is, under anything resembling politics as usual—the situation is hopeless. And unless you’re willing to look your viewers in the eye and tell them as much, you’re not truly leveling with them about what it will take to make a real difference in the climate crisis. I don’t know whether it’s too late for us to avert full-blown climate catastrophe, or what “too late” would even mean. But I know this: it’s too late for us to worry about sounding “reasonable” by Washington or mainstream media standards. The situation we face is utterly insane—and any serious response to it is going to sound completely radical and crazy (as I wrote in a Boston Phoenix cover story that was quoted at length in a Nation editorial on Keystone last February), or at the very least hopelessly naïve. So be it. The question is, are we going to tell the truth—or not? We heard just a hint of this sort of unvarnished truth-telling in Bill’s voice when he told you that there is no solution other than to stop burning coal, oil and gas—and fast. How are we going to do that? I’m afraid your viewers were left with the impression that an eventual price on carbon, combined with some EPA regulations and some entrepreneurial pluck, will somehow be enough—as opposed to the kind of society-wide, WWII-scale mobilization that many believe it will take. And if we’re not willing to call for that kind of full-scale solution, then we need to be honest about our willingness to accept the consequences. Which are pretty grim. Sometimes I think the only people in this country who are really willing to face up to the situation we’re in, and to act accordingly, are the folks I know, most of them young, who’ve engaged in nonviolent direct action—spending days and nights eighty feet up in a tree, or locked-down to construction equipment, or barricaded inside a section of pipeline to stop planet-destroying fossil-fuel infrastructure like the Keystone XL from being built. Or putting themselves in the way of a coal shipment. Or chaining themselves to a mining truck on a West Virginia mountaintop. At this late date, engaging in the climate fight in a serious way requires some serious courage and commitment and risk-taking—and not necessarily of the physical kind (only a comparatively few people can be expected to have that kind of courage), but certainly of the moral and political kind. And the journalistic kind. I believe the burden falls as much on us as journalists as on anyone else. Maybe more so. We need you out there, Chris, telling the truth. I don't really disagree with your point, Wen, which is that we didn't emphasize the full scope and depth of the problem and scope and depth of the solution. We let people off too easy, we painted too encouraging and rosy a picture. But that was a choice, and one I still stand behind. There are different aspects of the climate story one can choose to emphasize and different tones to strike, partly depending on the audience or the specific set of facts involved or, as in this case, one's own judgment about how to best penetrate the reflexive shell of indifference and hopelessness that even the most conscientious people have erected between themselves and the problem. Some think that doubling down on the severity of the crisis—its world-historical size and importance—will break through, but I know that I find myself retreating even further from that kind of storytelling. It is very, very easy to look at the facts as they stand now and conclude that we are screwed. And, perversely, the right has begun to very ably use this in their own rhetoric. Albert Hirschman once divided reactionary arguments into three categories: perversity, futility and jeopardy. We are now seeing the right pivot from arguments that emphasized perversity and jeopardy to sheer futility. I hear it all time: "OK, even if we act, isn't it too late? Won't China and India just keep pumping carbon into the atmosphere?" Etc. So I strongly believe that it is extremely important to convince people that the problem is, in fact, solvable. Our record of environmental regulation of pollution, in fact, shows that very often the eventual cost is far, far less than was originally estimated. Human ingenuity is an incredible thing! So if you picked up a certain upbeat undercurrent in the show, you weren't wrong. I happen to think the problem, as big and terrifying as it is, really is solvable and really will be solved. And I think it's doubly important to let people know that so as to engender the level of investment and action we need to make sure that hopeful future is ours. Earth is changing, and Bill McKibben outlines the movement we need to confront that change.